A police presence was necessary at the Western Wall in Jerusalem on Friday, as women from the liberal Women of the Wall group prayed at the site for the first time legally. The Washington Post reports that hundreds of ultra-Orthodox men and women gathered to prevent the group from praying at the holy site. The protesters clashed with police and threw garbage at the Women. Israeli media suggests that community leaders, rabbis Ovadia Yosef and Aharon Leib Shteinman, encouraged female students to hold a mass prayer at the Western Well in order to push out the group. Police protected the Women of the Wall with metal barriers and human chains. It is a change of pace for Israeli police, who historically come down on the side of the Orthodox worshippers. The switch in position comes after a landmark court order recognising the right of the women to pray aloud, and with liberal Jewish traditions, at the Western Wall in the Old City. Police were ordered to stop detaining women for praying at the site. Catherine Leff from Women of the Wall claims that Haredim (conservative orthodox Jews) spat at the group, and that their bus was pelted with rocks. Three ultra-Orthodox men were arrested following the clash, and two police officers were ‘lightly injured’. 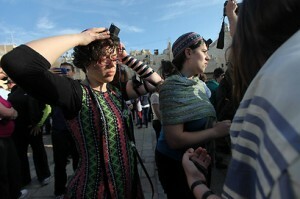 ‘It’s a historic moment,’ said Shira Pruce, a spokeswoman for Women of the Wall. ‘The police did an amazing job protecting women to pray freely at the Western Wall. This is justice’. This entry was posted in News, World and tagged in brief, protesters, women, women of the wall. Bookmark the permalink.